One big question we had when we considered purchasing this home was “What do we do with that rocky hillside?” While most perspective buyers obviously looked at this backyard and the steep driveway and ran away, we figured we would come up with a solution to tame this sloping yard. 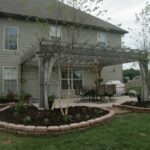 After milling over landscape options, from retaining walls (too difficult to get materials up the side of the house) to waterfalls (too costly and again there was the materials problem), in the end we came up with a cost effective, yet attractive solution. 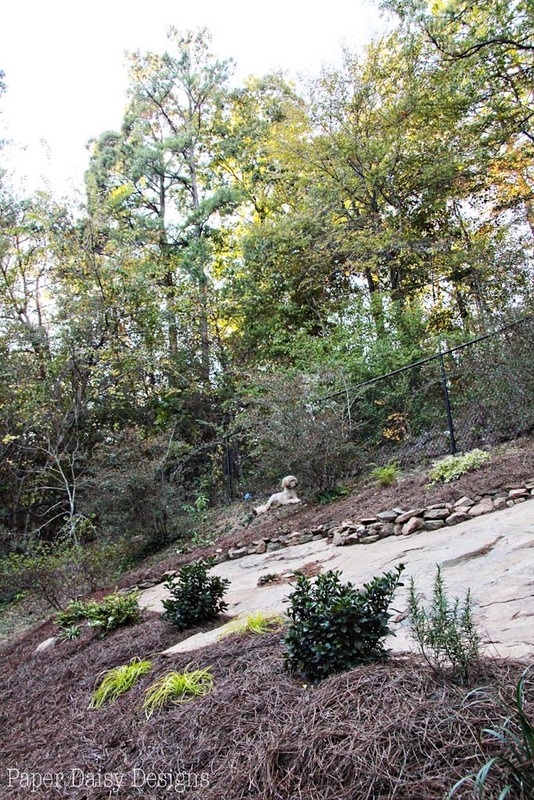 We decided to just embrace our Alabama sandstone covered backyard and create a beautiful, naturalized landscape. 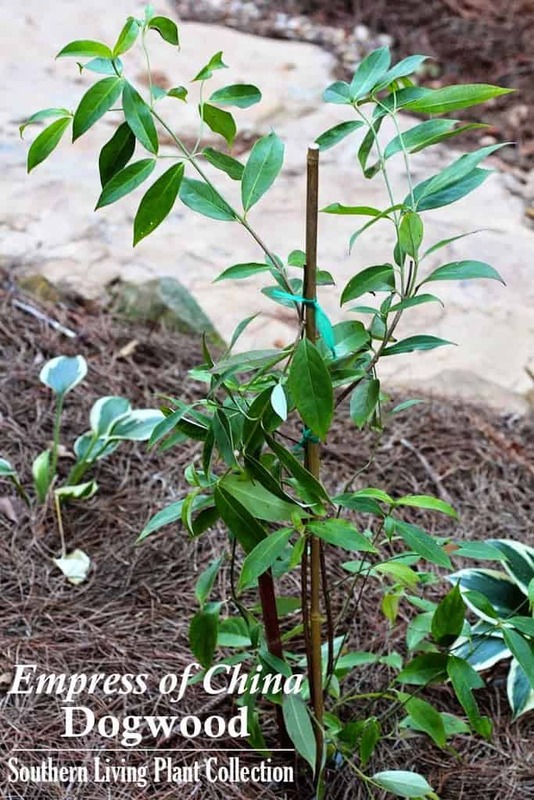 With the help of the exceptional plants from Southern Living Plant Collection, we selected mostly evergreens that will insure a lush, green hillside year round. To truly appreciate the transformation, you have to see what it looked like before. When we first moved in, the patches of rock you see were still covered with “grass”. We quickly discovered it was a nightmare to cut with a mower given the degree of the slope and the shear amount of rocks that seemed to just pop up out of the ground. 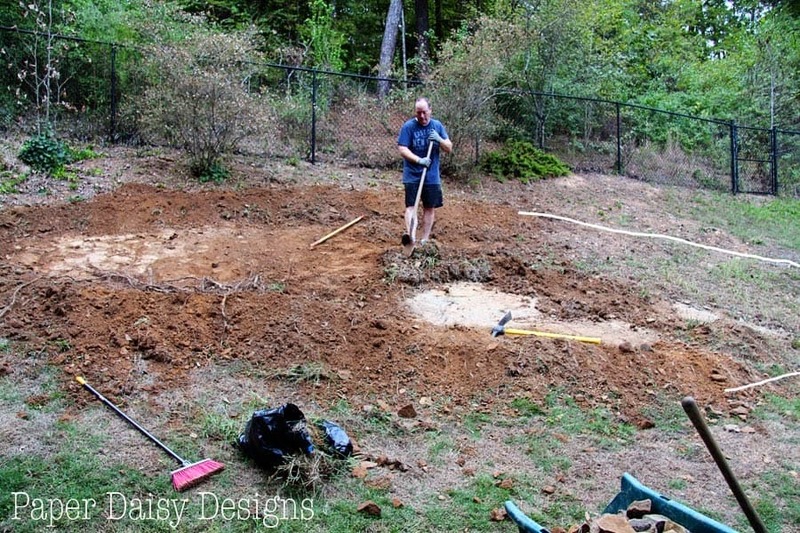 After one grass cutting adventure, my husband, Richard, took a shovel to the areas where rock was peeking out. 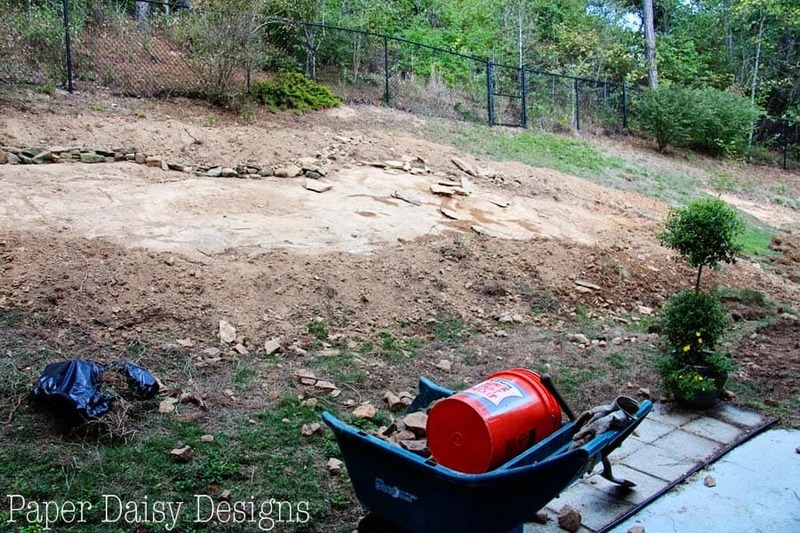 That’s when he realized that our backyard was actually one expansive piece of sandstone covered with topsoil. After looking at those unearthed patches of rock for several months completely perplexed, but still trying to revive the grass, it finally hit me that the rock underneath had to be more attractive than what we were seeing. Richard eagerly embraced the idea of ending the acrobatic moves to cut the grass. The only reservations we had about the whole project was the drainage issue. 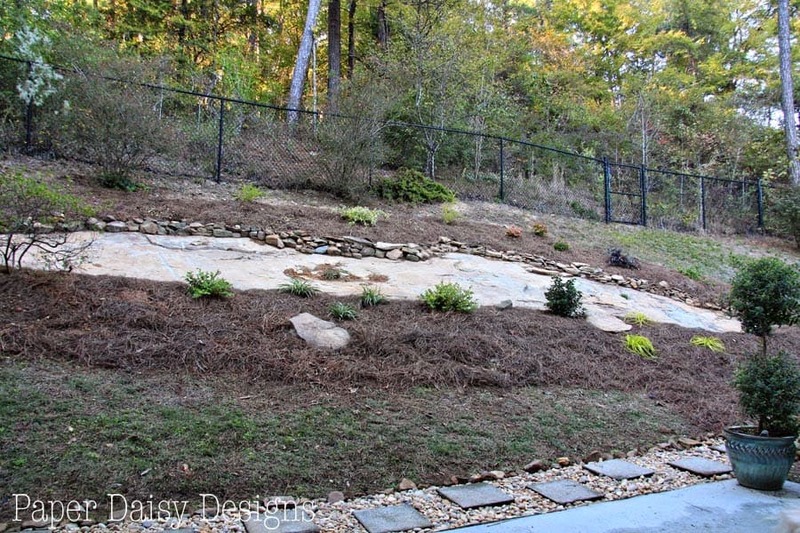 Following some discussion and research, we settled on adding a dry creek bed to supplement the existing french drains. 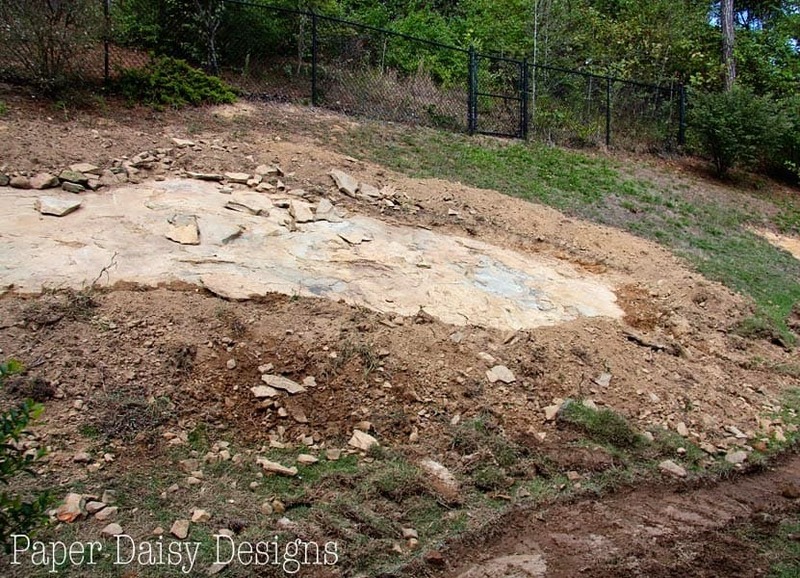 Once we were ready to begin our project, I spray painted an organic shape to reveal and we started to dig out the rock. While it was several afternoons of hard work removing the rocky soil and grass, the more we uncovered the more excited we became. To help secure the soil at the top of the rock, I gathered the rocks we excavated from the dig and stacked them along the edge. While it looks fairly random, I carefully selected rocks so that they fit together tightly. As I mentioned, the one concern we had with the Uncover the Rock project was how to control the drainage. We knew that rainwater would come off the rock much faster with the soil removed and felt the need to create a diversion for this swiftly moving water. 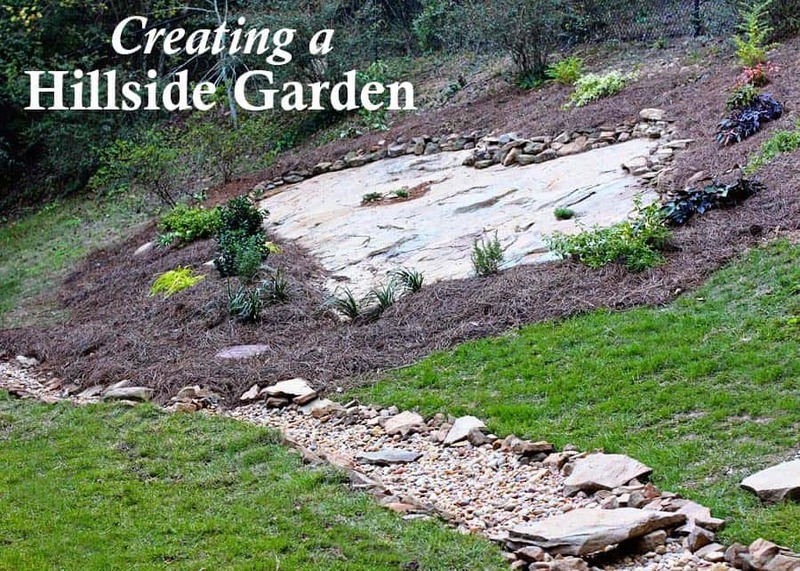 A dry creek bed that would divert the water to a drain at the far side of the yard and away from the house as well as provide some visual movement across the yard. 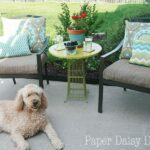 I’ll have a full tutorial on how we built the creek bed in another post. 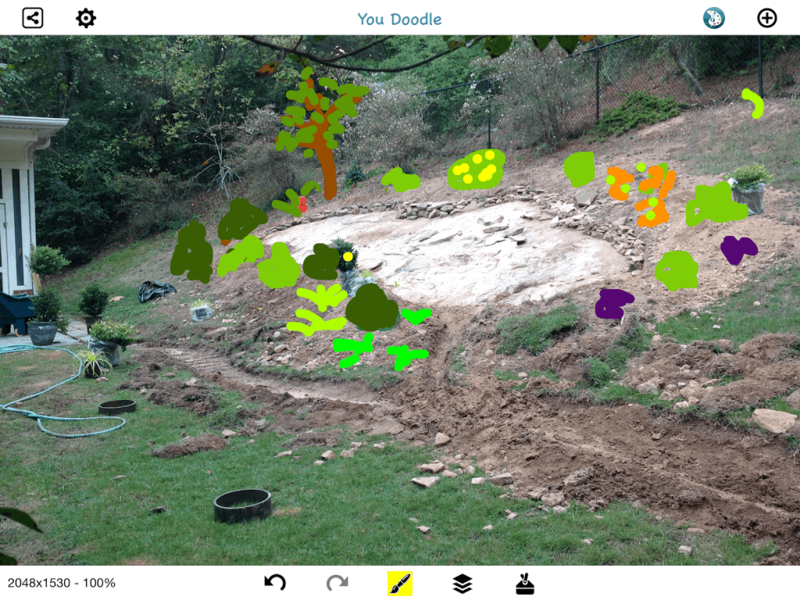 After a couple sore nights, we were ready to start planning the actual garden around the rock. I began by sketching out a little plan over a photo I took on my iPad. The next day we placed the plants in their spots to get a better feel for how it all looked. I wanted to create a balance between light and dark green values and a variety in texture. 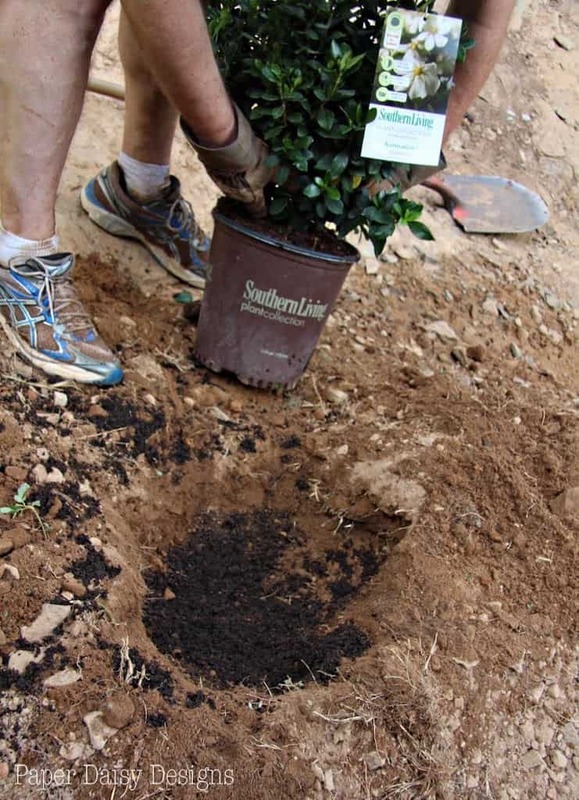 For each plant we dug a hole larger than the container. 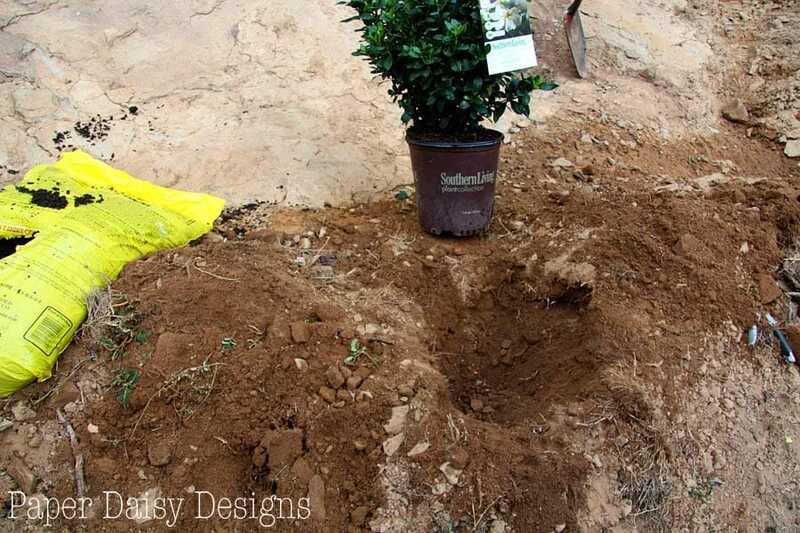 For our rocky, depleted soil, amending with compost for nutrients and peat moss for water retention and drainage was important. 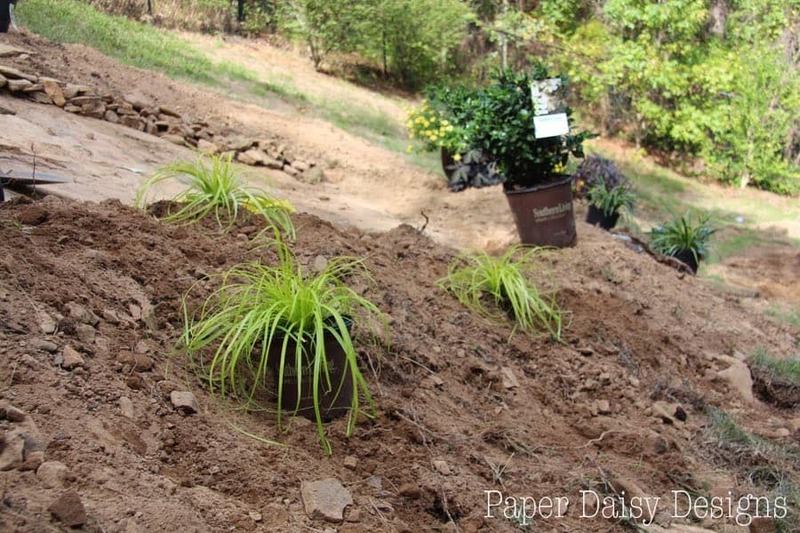 I think this approach is a good idea for any new plantings. To remove the plant from the pot, we tipped it on it’s side and gently pulled from the base of the plant and then from the pot. 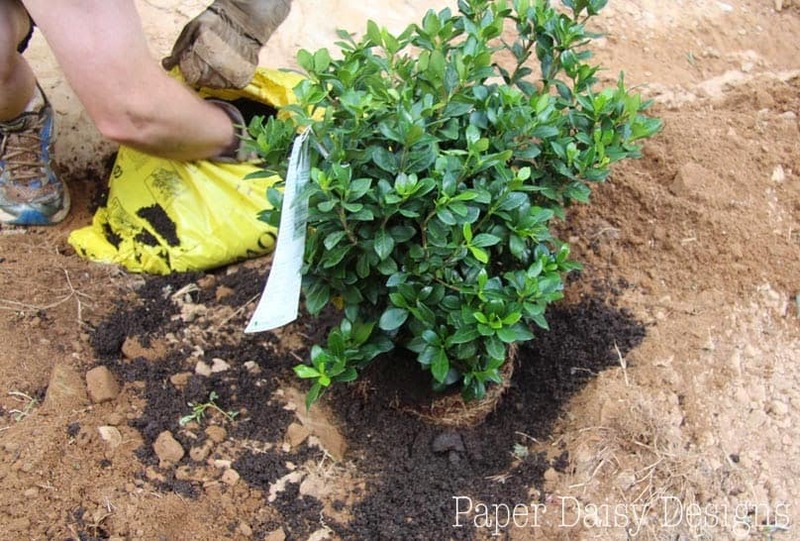 Then continue to amend the soil around the plant, using your existing soil mixed in. 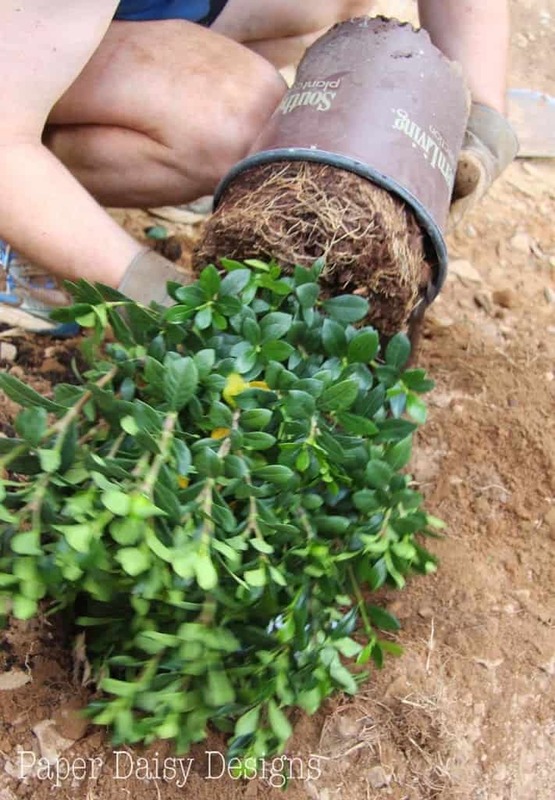 You want to cover the plant just to the existing root level. 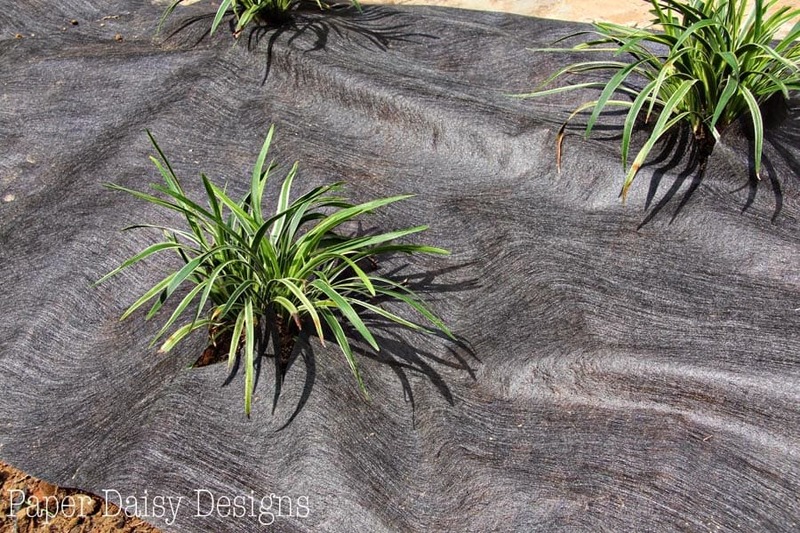 After all the plants were in place, we covered the bed with high quality landscape fabric. 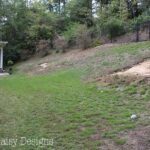 While this is a rather costly step for an area this size, pulling weeds from a hillside is something I want to avoid. 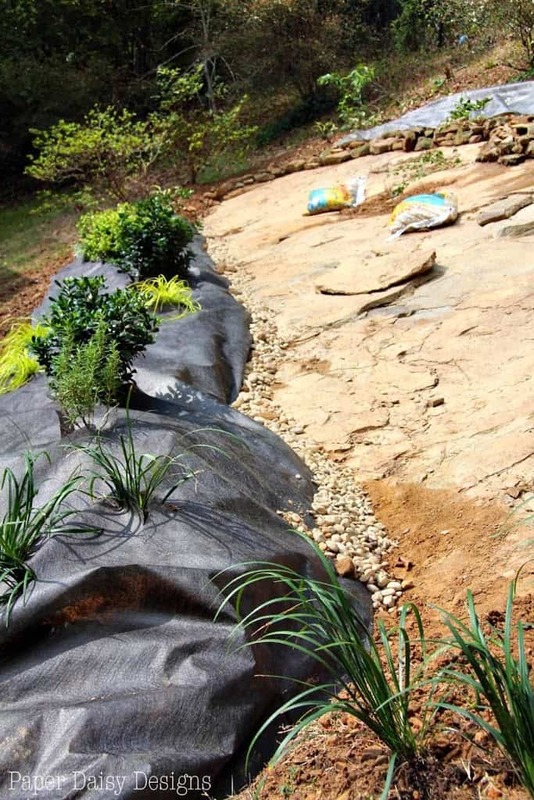 The landscape fabric is also an excellent step to reduce erosion. We gently unrolled the fabric, cutting slits to form a hole where the plants could be pulled through from underneath. We used U-pins to secure the landscape fabric where necessary. 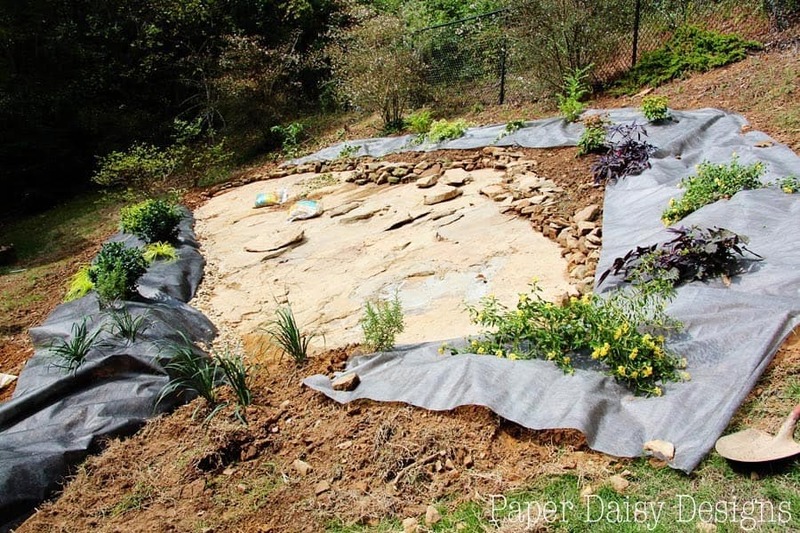 On the backside of the raised bed we used river rock to hold the fabric down and eliminate erosion of the water moving down the hill toward the down spot you see below. 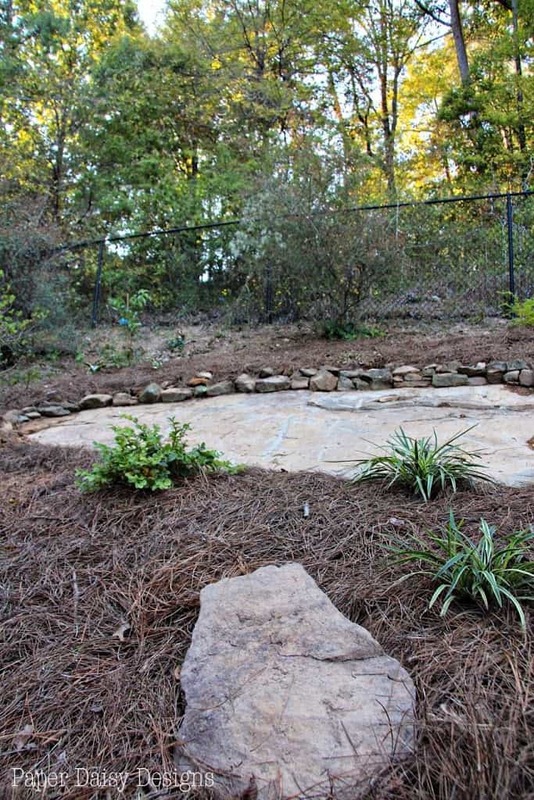 It was time to bring in the pine straw mulch and make it all look pretty. Then we could finally step back and admire handy work and those beautiful plants. Along the front of the rock are the Scentsation Gardenias. 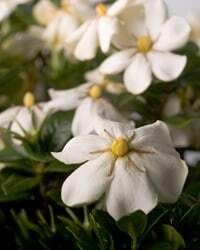 I choose this variety specifically for it’s unique, fragrant flower and dark emerald foliage. Are those not the most adorable flowers? 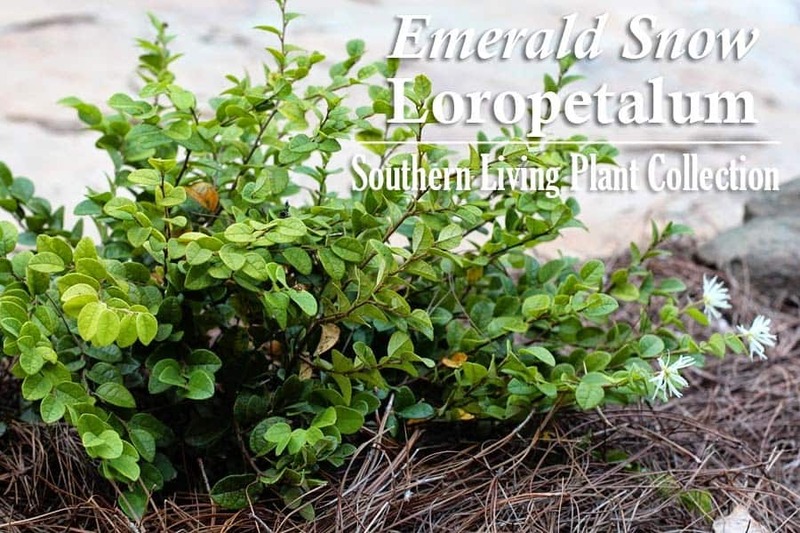 Also along the outside are the Emerald Snow Loropetalum. 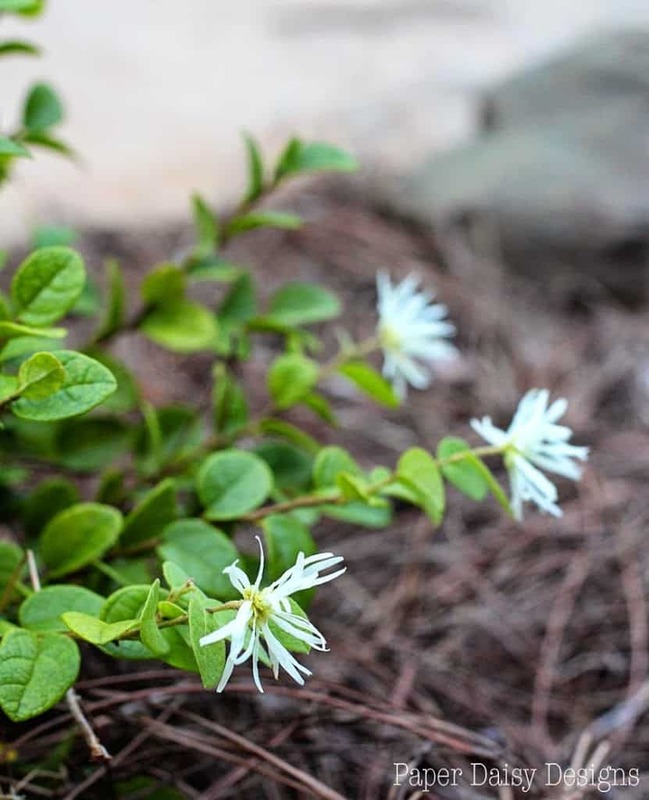 The small white blooms remind me of little firecrackers. 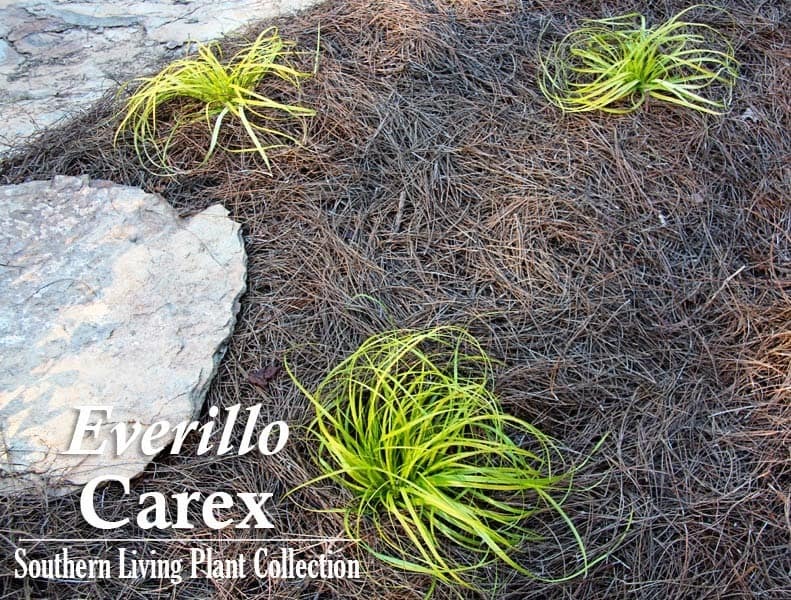 To break up the shrubby-ness, I chose to plant this grouping of vibrant grass, Everillo, Carex. 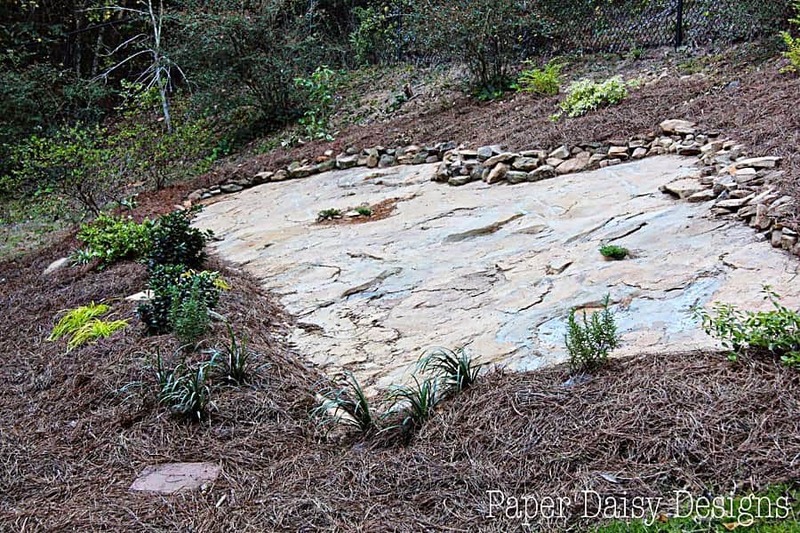 To add interest to the mounds of pine straw we used larger pieces of stone that had separated from the rock as ornamentation around the bed. On the upper left side of the bed is what will likely become the star of this garden every spring, the Empress of China Dogwood. 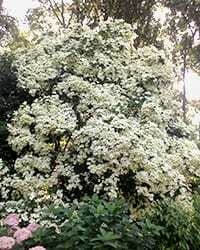 I can’t wait to see this vigorous growing tree look like this in the future. Moving around the top of the bed are the Sunshine Ligustrums. 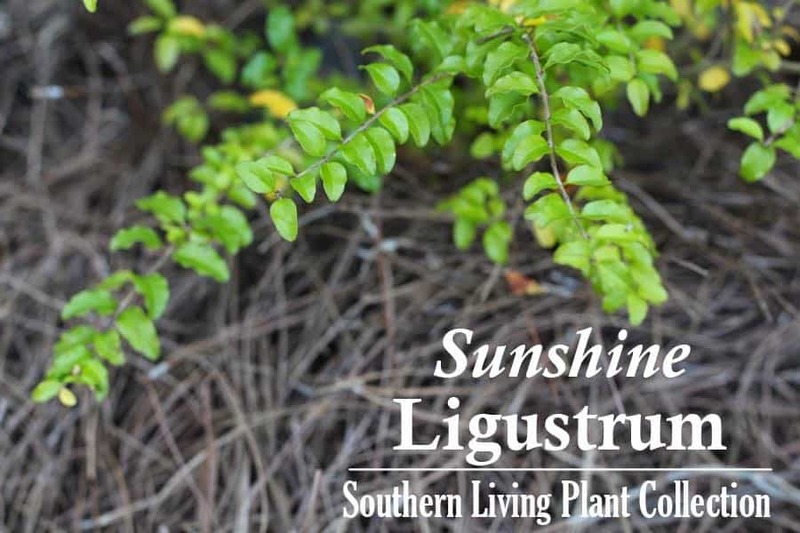 Unlike other ligustrums, it’s a low growing variety that does not reseed and has a gorgeous bright green foliage. 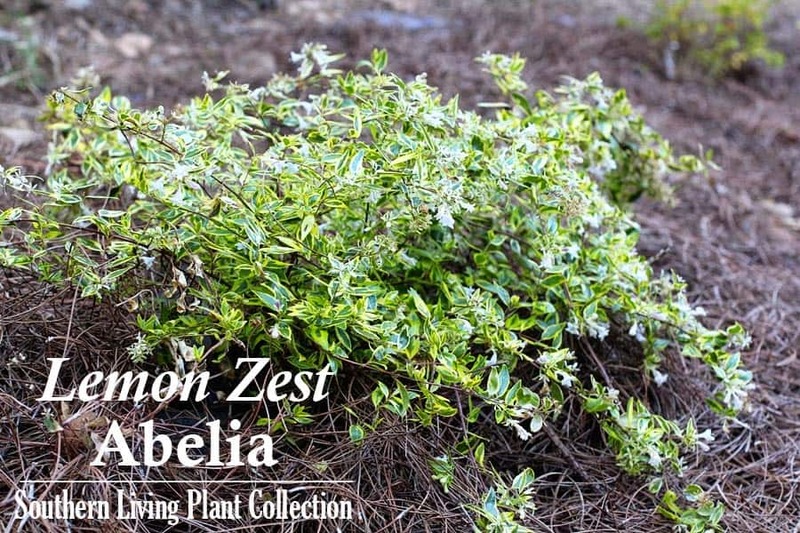 In the center of the ligustrums and planted at the top peak of the rock is a variegated Lemon Zest Abelia. This long bloomer is still covered in small trumpet blossoms even this late in the fall. And last but certainly least, are the Blush Pink Nandina. The pink and green combination bring a spark of brightness to the otherwise green shaded border. Now the view from our small dinning patio is something worthy of beholding. 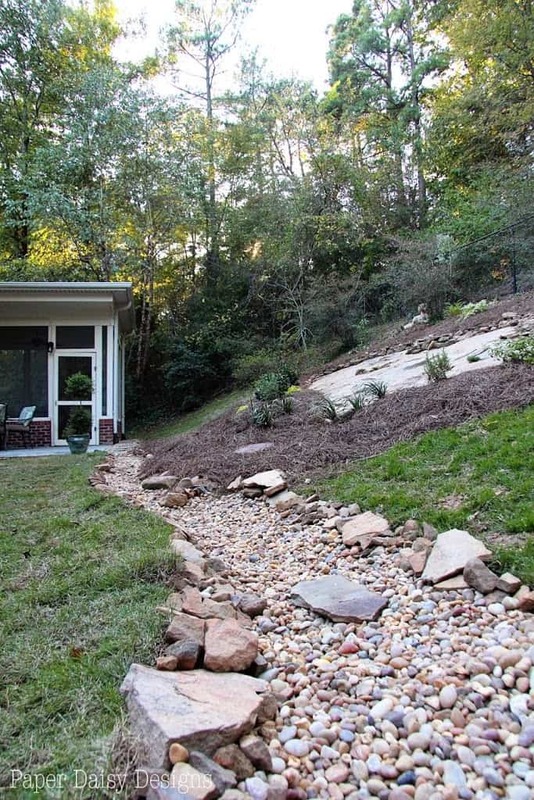 And I love how the functional creek bed naturally blends into and creates interest through the yard. As the plants continue to grow and become fuller, I think the whole area will almost blend into the surrounding wooded area up the hill. 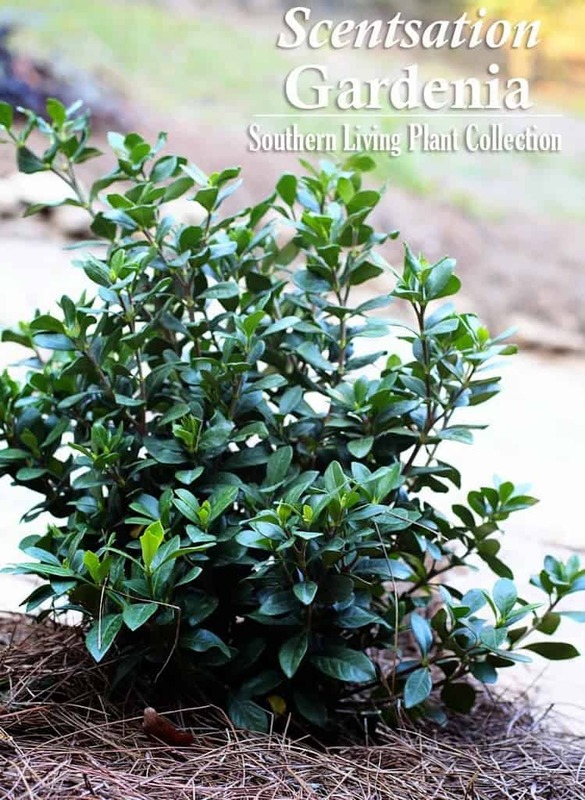 I also feel confident in the quality and variety of carefully selected plants from the Southern Living Plant Collection. I will definitely be sharing updates on how this garden is growing in the future. 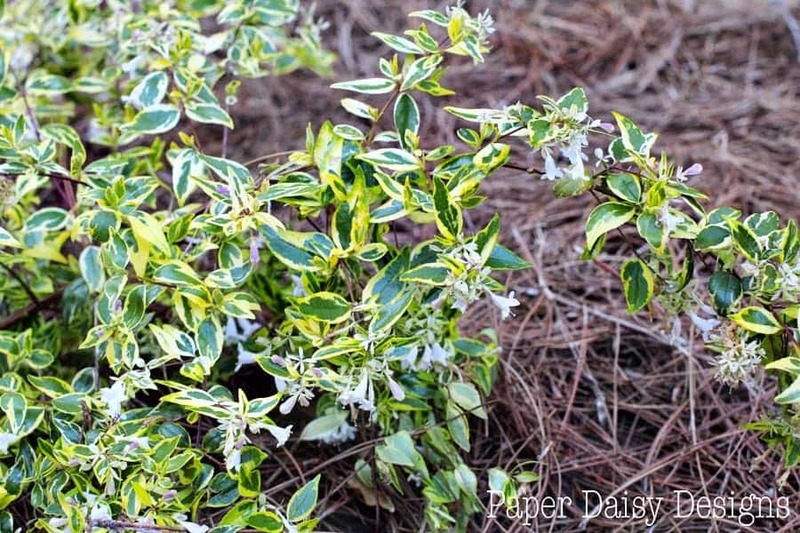 Disclosure: I was provided some of the plants in our hillside garden by the Southern Living Plant Collection. All opinions and designs are my own. Special Thanks: To my dear husband, who worked tirelessly hauling rocks up the hill, shoveling and more shoveling to uncover our rock. Thank you for being my partner through all the sweat, blood and mud. Thankfully the grass we have is slow growing. 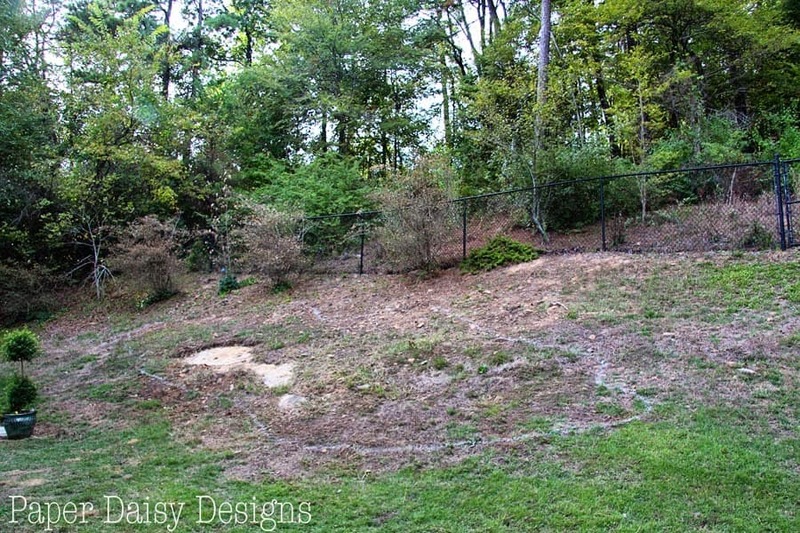 I have plans for steps/stairs up to the wooded area and the other side of the yard. The hope is to eventually just to have grass on the flat part close to the house.